I managed to sneak a piece in a juried show in Tacoma, Wa, juried by famous painter Jermey Lipking. I don't enter many juried shows as I don't take rejection well but I guess that's part of the gig and then there's the hastle of deadlines, bios, and receptions. Juried shows are a form of validation. One works in a vacuum doing your own thing, not knowing or caring for that matter if a piece will sell but a living must be made so out there goes your heart and soul to hang on a wall for others to throw darts at although people are kind and one never hears the negative, kind of like Facebook, nobody says what's really on their minds when you post a painting on FB everyone's like "lah, lah, lah, beautifull colors". I guess that's the real value of juried shows, at least you get a thumbs up OR down about your work. It's a hard row to hoe but as much as I seem to complain I like the validation. 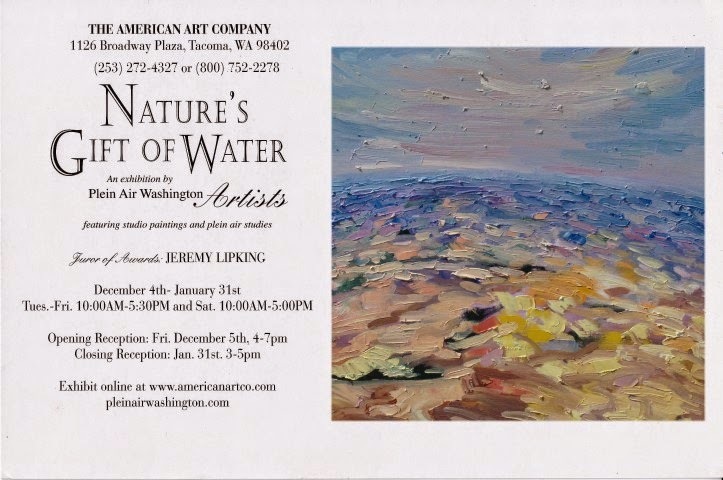 This show had a theme, "Nature's Gift of Water", and was promoted by the Plein Air Painters of Washington, PAWA, www.pleinairwashington.com. 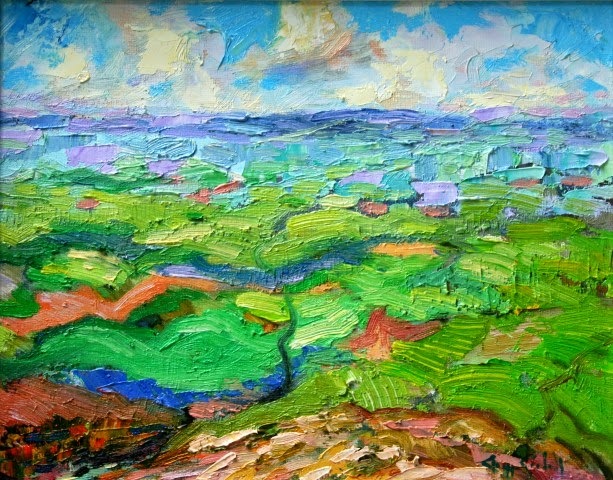 They wanted a plein air piece and another that was a studio piece made from the plein air study. Mr. Lipking chose some fine paintings so there must have been an impressive selection of work from which to choose. I look forward to meeting him and the other painters in the show. The American Art Company http://www.americanartco.com/ has been around since the 1800's. Had a great time showing at Susie Engelstad's Arthouse Gallery. Sold 6 paintings, was invited to contribute work to a benefit for the Capital Theater in Olympia and another invite to compete for the cover art at the next art walk and made some new art friends. Susie and staff did fantastic and the band "Pearl Django" was an extra bonus that played to a packed house. Showing on the west/wet side of the state has been a great success. We've proven to ourselves that sales of art is all about traffic. Now to find more galleries. This 30x40 painting sold in the first half hour.